That dark chocolate in your hand may be delicious, but the FDA has found that it also probably contains milk. Hopefully you're not allergic. Chocolate has been in spotlight recently, but not always for good reasons. 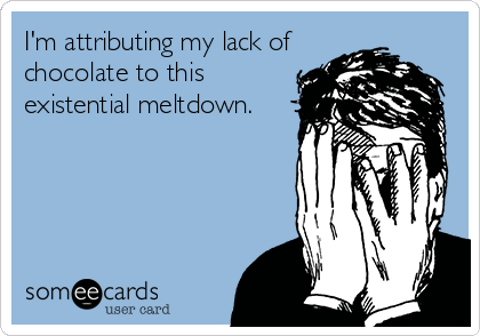 First, there was the uproar over Hershey’s cutting off our UK Cadbury supply, and now the FDA’s revelation that around 59% of dark chocolate we’ve been consuming actually contains milk after all—it’s almost enough to make any cocoa lover have a full-on existential crisis. Here’s how the study worked. Milk is considered one of the eight major food allergens by the FDA. (The full list also includes wheat, eggs, peanuts, tree nuts, fish, Crustacean shellfish, and soybeans.) If any amount of one of these eight major allergens exists within a product, the FDA requires that it be listed on the label. Between September 2009 and September 2012, the FDA received many reports of undeclared milk in dark chocolate. So they decided to investigate. They tested 100 dark chocolate bars obtained from different parts of the U.S., with each bar being unique in terms of product line and/or manufacturer. Of course, how chocolate containing milk is labeled may differ depending on the circumstance. Some labels might say “may contain milk” or “may contain traces of milk,” while others might actually go so far as to say “dairy-free” or “allergen-free.” Some might not even mention the word milk anywhere on the label. Inconsistent labeling is also a problem. Researcher Binaifer Bedford specifically calls out instances of a bar being labeled “vegan” (in other words, containing no animal-derived products), yet paradoxically containing a precautionary statement about the possible presence of dairy milk. A separate issue is the fact that even within products that “may contain traces of milk,” there’s no way to know how much milk may have been involved. If you aren’t allergic to milk, you probably don’t care—but if you are, that amount can make all the difference in the world. 2 out of 17 of the chocolates labeled as “dairy-free” or “allergen-free” contained milk. Still, the chocolates in this category were still the least likely to contain milk out of all categories the FDA tested. 55 out of 93 dark chocolate bars (59%) that had no clear indicators of the presence of milk were found to actually contain milk. Additionally, all seven bars that said they contained milk on the package also contained milk…so at least those milky bars weren’t lying. 6 out of 11 bars tested that were labeled as having “traces of milk” were found to contain such high levels of milk that severe reactions could be possible in allergic individuals. At least “traces of milk” was somewhere on the label to warn those people off. There’s also always the FDA’s Consumer Complaint division if you want to take your issues with undeclared milk in your dark chocolate to the next level. We don’t know what types of dark chocolate bars the FDA tested. For example, were they all the kinds of chocolate you find at the supermarket or gas station, or were there some high-end chocolates tested, too? Are you more likely to get a honest statement about milk content on your high-end chocolate, or does that even matter? Finally, here’s the biggest question of all: If we can’t turn to dark chocolate when we’re sad, what can we turn to instead? Now that you’ve thoroughly crushed our dreams, help us out, FDA.